Book in One Word: Golden. 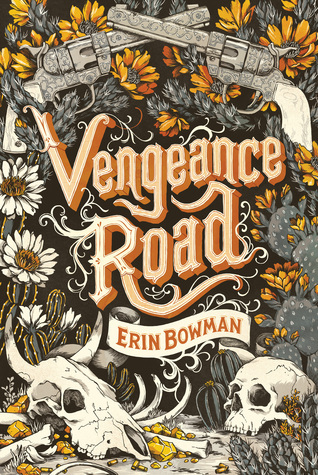 I'm not sure what part of Vengeance Road I saw and was very intrigued by first: the synopsis (aka, hello, western) or the freaking gorgeous cover. Either way, I'd had my eye on this for a while, and was pretty excited to get approved for an eARC. And then I finally read it, and, well... Do you ever go into a book thinking you'll probably like it, but you don't think you'll really like it? I don't mean that in a negative or offensive way, but do you ever just go into a book with certain expectations for how much you'll like it? Because I had that with Vengeance Road, and I was very pleasantly surprised, because I really, really liked it--much more so than I thought I would. Kate is a fierce girl with a sassy mouth. She wasn't exactly raised like a proper lady, and she does spend a lot of time in Vengeance Road being Nate Thompson. Either way, she was a fantastic protagonist and I loved hearing her story and being in her head. I was also a fan of the cowboys and the banter they exchanged back and forth with Kate/Nate, and I was a little partial to Jesse. (In case you're wondering if I ship it, I do.) And even though I'm not very familiar with westerns--I've only see a few movies and read like no books--I totally get the western vibe and the book is filled with western elements. You've got the small towns and the saloons, horses and hot weather on dry land, one very bad guy, murder and gold, and people shooting first and asking names later. Like I said, I don't know westerns, but this screamed it, and it was darn tootin' fantastic. Going into Vengeance Road, I was a little unsure of how the voice of the novel would work--it coincides with the era, of course, and I figured it would take some getting used to and that I might not click with it. But I totally did. It is so effortless to slide right into the mood of this book and just feel the voice. Sure, there was a term or two I didn't understand, but that doesn't matter because the diction in this novel is on par--above par, possibly--and just worked perfectly. It never felt unnatural or like Erin Bowman was trying too hard to achieve the proper diction--it sounded perfectly natural and like Bowman was existing in 1877 Arizona herself. And the story itself--extremely well done and excellently paced. Despite the bumpy road Kate is on, the story moves smooth as butter and that, coupled with the old western diction, really helped make this novel come together so wonderfully. Did I like it? Yesss! Did I love it? Almost, but close, and I heart it. Would I purchase it? I do believe I have this preordered. Who would I recommend it to? Everyone! Whether or not you're a fan of westerns, give this one a try. It's a well written story that's well worth the read. The cover on this book has me really excited, not to mention that it's also a WESTERN ... and SO MANY PEOPLE ARE GIVING THIS GOOD REVIEWS! The book looks refreshing. Can't wait to pick it up.